days are a roller coaster. baby’s been under the weather – molars… and maybe sick? we leave on crazy vacation this coming monday for 6! weeks. but today. today i feel inspired. i taught someone how to spin yarn on her spinning wheel last night and now all i can think about is how much i love to teach. i’m working on the class schedule and describing the classes. so fun! 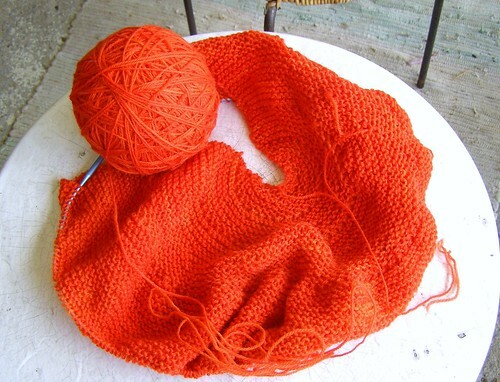 i’m knitting a springling shawl sample for the shop because i needed something simple on my needles. and all i can think about is the possibility of light weight yarn garter stitch. i want a yoked summer sweater. and there must be a baby sweater. garter combined with colorwork? oh the possibilities. also. this color. bright orange-red. it makes me happy. This entry was posted in community, cosyknitsliterally, knitting, patterns, spinning by cosymakes. Bookmark the permalink.